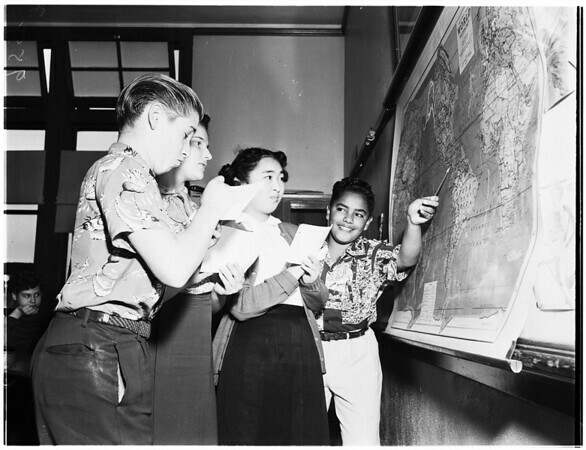 Foreign adjustment classes for new Americans in City Schools (Berendo Junior High School), 1952.
and Jose Portillo, El Salvador. (Another l - r is: Olga, Joe, Shirley and Jose). 93: Special instructor Lorraine Ross shows class picture of boat, used in teaching visually. 85: Lothar Wolff -- teacher. l to r: Valdmir Vdovkin of Yugoslavia and Yuergen Steinbrenner of Germany with their name cards, printed to aid children in becoming acquainted and to read, too. 86: Teacher Rose Marie Vardanian and pupil Shew Ng, 15, of China, looking at wall display of early president of U.S. Pupils eager to learn US history".